Opinion: The Step Vader Couldn't Take...Or Did He? It was about two months ago that we sat down and watched as (SPOILER) Ben Solo or Kylo Ren, faced his ultimate test and took on his father Han Solo. We all know how that ended. But wasn't it interesting that Supreme Leader Snoke referred to it as the ultimate test? Lets take a deeper look at Kylo shall we? The villain who desires to be just like his grandfather, Darth Vader. As Rey points out he wants nothing more than to be just as good (or bad I suppose) as Darth Vader. But he isn't, and he never will be. He looks at Darth Vader and sees his only failing was not being able to allow his son, Luke to be killed. So perhaps in Kylo's mind, if he could kill his son then that would make him one step beyond Vader right? That is what even Vader failed to do! While Kylo does not have a son (That we know of! ), he does have a father. Thus the scene we have all come to dread. Yet, based on the way Kylo acts further, I think it is obvious he feels a sense of unsatisfaction. He lacks the fulfillment, the feeling of being immerses in the dark side that he desired. Why? Well it could be that perhaps he didn't actually murder his father he only think he did. Or it could be simply that the dark side is a path to destruction and the murder of loved ones is the ultimate destruction? While I love both of these theories it makes me wonder what would have happened if Vader did kill Luke? Vader wasn't looking to prove anything at that point in the saga, like Kylo was looking to prove that he could be as good as Vader. It is strange though that Vader's first reaction was to save Luke. Looking at the life of Anakin Skywalker/Darth Vader he is usually act impulsivly out of anger first, regret later. I wonder if perhaps he made the mistake once before and learned from it. But Darth Vader doesn't have a father, and from what we know of only two kids. Who could he have done away with that would have had that much of an impact on the mechanical menace? It will be interesting to continue this discussion in two months. 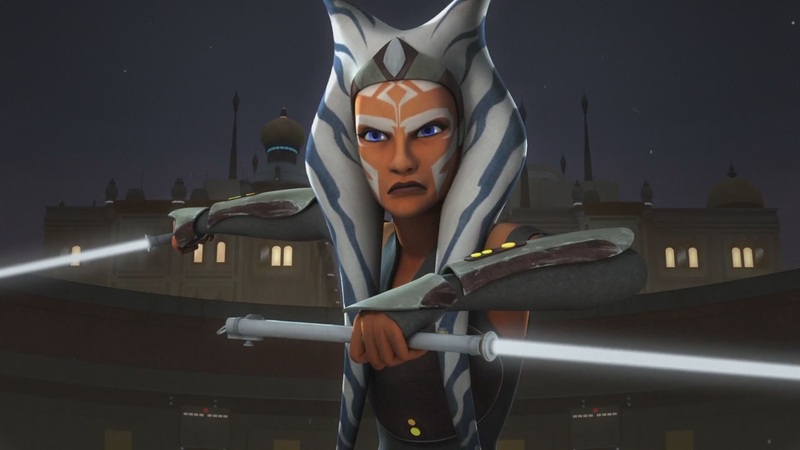 What implications does Ahsoka Tano have on Kylo Ren? Here is to hoping that Vader learned the lesson when he killed Padme. .... and if he didn't lets be looking out for catwalks and emotional moments where you think Vader might turn good. Don't trust it! I like the theory that Kylo Ren is a double agent, infiltrating the dark side only to reach snoke. Han chose to walk towards what he knew was his death, towards Kylo, his son to "help him do what he cannot do". So the rebels and his son can achieve the ultimae goal of destroying supreme leader snoke (darth plaegus). Apparently this writer never saw a new hope where Vader kills obi wan, who is the closest thing to a brother or father figure. Vader blames obi wan for what happened to padme and not himself. It's his hatred that he allows to dominate his emotions. When Luke comes around, he doesn't have any preset hatred for luke. Luke's compassion for him in Jedi is what conflicts him. For Luke is part him and padme, and perhaps the reminder of padme is why he cannot destroy luke. Ahsoka betrayed Vader in his eyes by leaving is apprenticeship. That will be met with anger. He will offer her a chance to be his apprentice again as a sith. When she once again rejects him, he will destroy her. It is that simple. Kylo ren still feels the love leia and Han felt for him and that conflicted him. It is hard to hate someone who only gives you love. That is why kylo struggled and is unsatisfied. For their is no long lasting satisfaction in murder. He will be like Vader and unsatisfied until he is redeemed again, if ever. The "mistake(s)" that Vader / Anakin made before were (1) not saving his mother and (2) not saving his wife. He finally used his powers to save his son. I also reckon that Yoda, and maybe Ben, knew there was still good in Anakin. Neither says that Luke must kill Vader to become a Jedi ... Luke is the one who assumes that. Yoda and Ben both say he must FACE Vader - and it is Luke's refusal to choose the dark side, to give into his hate, that makes him a Jedi. Do none of you remember Anakin killing Padme...? Very interesting theory! I have not heard this one until now. I don't believe that's what's actually going to happen, bit very interesting none the less. Some of the theories are entertaining, but it's never that complicated in Star Wars. Anakakin/Vader did not kill Padme. Sidious killed Padme. 3. Padme gives birth and "loses the will to live"
However, someone else made the observation - Vader vs. Obi Wan is the same exact scenario of Ben vs. Solo. Obi Wan - "Why do I get the feeling you'll be the death of me?" Anakin - "Don't say that, you know you're like a father to me."